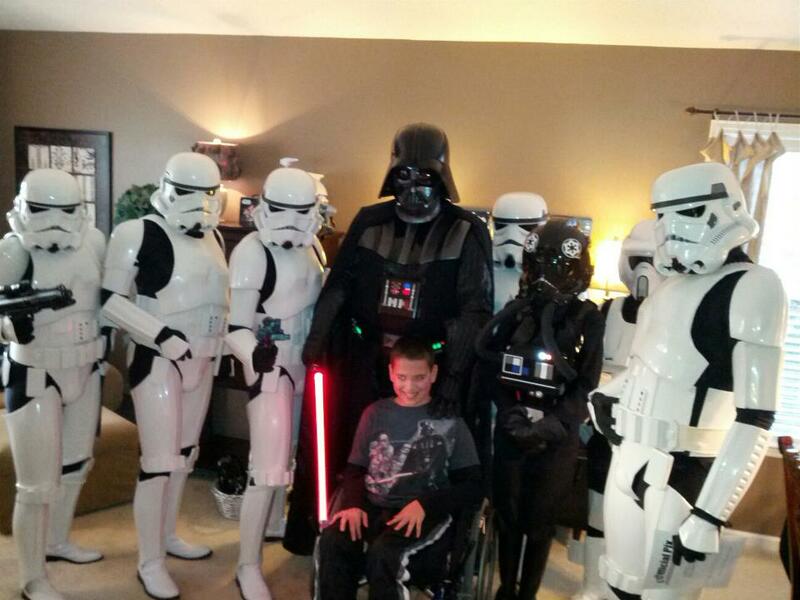 I got the privilege to troop Ethan’s 12th Birthday party and it was great to be a part of and one to be remembered. Here is a bit of the story as told by his Mother Jennifer. This past July, our 11-year old son Ethan, had his 9th surgery at Wolfson Children’s Hospital. He was born 10 weeks premature and, as a result, has Cerebral Palsy. He has had 4 major surgeries in the past 2 years alone! We are so grateful that this most recent surgery should be last for a very long time to come! During the summer of 2010 Ethan watched his very first episode of Star Wars…and has been obsessed ever since! We are quite certain he could recite all 6 movies from start to finish! His love for all things Star Wars has become a family affair, including his 2 younger sisters, Emma 8, and Ella 5. We regularly attend Disney’s Star Wars Weekends, have many Star Wars character costumes hanging in closets, own all the Nintendo DS games (including Lego) and proudly sport our family of storm trooper helmet decals on the back of our minivan! All that to say, we wanted to send a note of appreciation for something you, Squad 7, did for our family. While waiting in the waiting room at the hospital this summer, as we have become so used to doing, eagerly anticipating Ethan’s surgery to be over, we were given a very unexpected surprise! We quickly felt as though we were in a scene of a movie when the elevator doors opened and out marched Darth Vader and some of his closest friends! Needless to say, we could hardly believe our eyes. We were beyond excited to take pictures with some of the beloved characters that our house has come to know so well! We so desperately wished our precious Star Wars loving son could have been there, too! We were given a couple of James Hance’s adorable signed prints and Wookie the Chew book! Winnie the Pooh has long been one of Ethan’s favorites since he was a “youngling” so we knew he would be over the moon about seeing this combination! When he was brought up to his hospital room after his surgery and recovery time, we shared with him the exciting news that Star Wars characters were actually in the same hospital that he was, showed him the pictures, book and prints. He was so thrilled at the thought of everything, even though he was unable to see you all in person, that we are confident it helped lift his spirits. On behalf of our son and the other children at the hospital, thank you so much for using your time, talents and love, to come visit kids and families who need a little pick-me-up and smile! Needles to say when we got to the party we approached the door with Vader leading the way. Vader knocked on the door and Ethan and family opened the door. Ethan’s face lit up with big smile and you could see the excitement as Vader wished him a Happy birthday. we all filed in one trooper after another and his eyes got bigger and bigger. We stayed and mingled with all the guest and took many photos for him to be able to look back on. One by one we wished him a happy birthday as we were leaving and we left him all smiles. This was a great event for me and I am glad to be apart of making Ethan’s birthday on he will remember for the rest of his life.